Potato Ransomware Removal Tool Guide to Decrypt Infected Files! 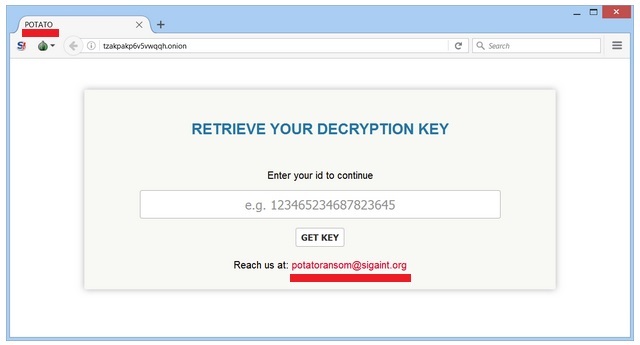 Potato Ransomware Removal Tool and Decrypt Infected Files! Here in this article, you will know how to remove Potato ransomware from your computer. For your reading convenience, I have split the content into several sections. The sneakers have found the best way to make money by exploiting the security of people. They develop ransomware to threaten people by encrypting necessary documents. And, it displays a message on your computer screen to send them money in the form of bitcoins in order to get the files decrypted. The truth be told, no one knows whether your files get to the normal state or not, even after sending them the money they want. That’s why removing the ransomware or decrypting the affected files is the best way to get your data back. 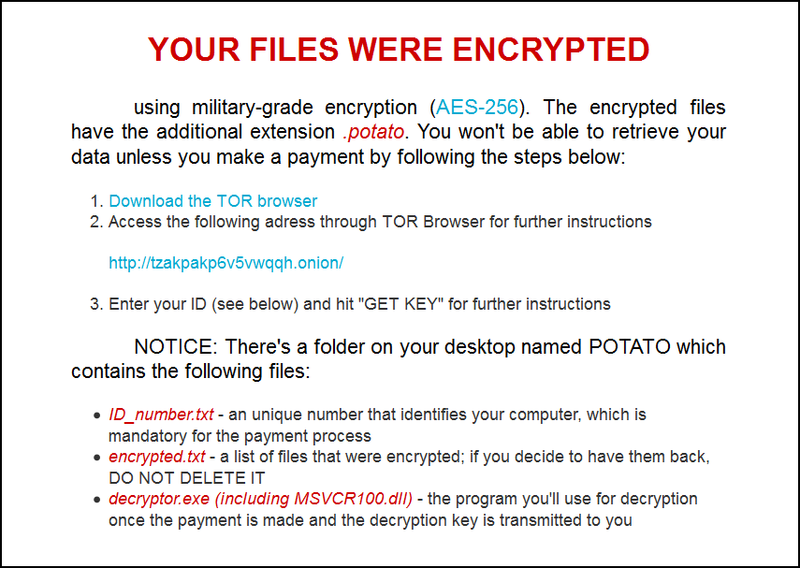 Potato ransomware is similar to another locky ransomware threats and Cerber ransomware. Once it infects a computer, it will scan all your files and connected cloud sources. The developers have specified the type of files to be affected by the ransomware. When it finds such files, it will encrypt them using AES-256 algorithm. No one can see the original files after this. All you see are files with .potato extension with random names. As you know, there is no software available to open such files. Along with the encryption, the ransomware creates two files on the desktop as well; README.png and README.html. Both the files include instructions to decrypt your files, but in a manner unhealthy to you. If you follow that method, you will have to send the proposed money (somewhere between $500-1500). You shouldn’t send them any money. As I said earlier, there’s no guarantee that they will stick to their words. After all, the people behind ransomware are criminals. So, they care less about their victims. How does Potato Virus Get into My System? There are multiple ways available for cyber criminals to inject a ransomware into your computer. The most commonly seen one is via a mail stating about you, winning a contest, giving away free paid account accesses online or getting huge chunks of money. Along with the mail, you will find an attachment as well. We all know that .exe is the most dangerous file extension. Most viruses come in the form of a useful .exe file. But we don’t know the fact that a virus can also be integrated to seem-to-be-harmless files like a PDF or DOCX document. For the same reason, most people open attached documents. As a result, Potato gets into their systems. This is not the only way hackers inject potato ransomware into a computer. We all know that there are thousands of people who search for free cracks and keygens for premium tools. Most of them turn their antivirus off while using cracks as well. When a ransomware is attached to a crack, it will be easy to get affected, with antivirus software in the deactivated state. So, I recommend you don’t open attachments from unknown email IDs. Moreover, no one is ever going to pay you hefty amount of money for free. So whenever you get an email about a free payment, you should overlook the email. Moreover, don’t go for cracked software. You can find some free alternatives on the web for any tool. Download them from the official website. You will not suffer later. Follow the same method if you system is affected with CryptoLocker Ransomware. How to Remove Potato Virus from Your Computer? 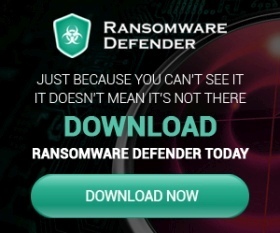 You can download some ransomware removing tools from the web to get rid of Potato from your computer. Hitman is a security tool, which can remove ransomware. Step 1: First, you have to install the software. Use the link given below to download the installer. Step 2: I hope you won’t find it difficult to install Hitman. Just open the installer and follow the on-screen instructions. You can do it just like installing any other software. Step 3: Once the installation finishes, the software will start scanning your entire system for security threats. It may take a while depending upon the number and size of your files. When it displays the scanning results, you have to specify actions for each malicious item and then hit Next. Step 4: Though Hitman Pro is a paid tool, you can use it free for 30 days. So choose the free license for 30 days. There you go. Step 1: You have to download the setup file first. An internet connection with decent speed is recommended. Step 2: Then, you must open the setup to kick-start the installation. Don’t worry! The process is the same as that of the installation of any other tool. Follow the on-screen instructions. That’s all. Step 3: After installing the software, you have to open it. On the interface, you can see a Scan Now button. Pressing on it will start scanning all your files. Step 4: You will get the results soon after the scanning completes. Select all threats there and choose remove. There you go. You may be asked to restart the system. Just do it. How to Decrypt Potato Ransomware Affected Files? If you are in decrypting the affected files, you can follow the method given below. Step 1: The tool we want here is Shadow Explorer. Download it. Step 2: Then, install the software by opening the setup and following the on-screen instructions. Step 3: Now open the newly installed Shadow Explorer interface. You will have to select a drive and then a date (we are going to restore the files into a previous state). Make sure you select a date before the system got affected by Potato ransomware. Step 4: Here, you have to select the target to save the previous versions of files. There you go! You can also use default restoration tools as well. You know how to remove Potato ransomware and decrypt the files affected by it, don’t you? If you have any doubts regarding this or any other ransomware, don’t forget to leave a comment below. I will reach out to you at the earliest. CryptoLocker Removal Tool: Decrypt CryptoLocker Virus Files for Free!